The NSW government makes major cuts to TAFE art courses, effectively ending many art schools by making them unaffordable. 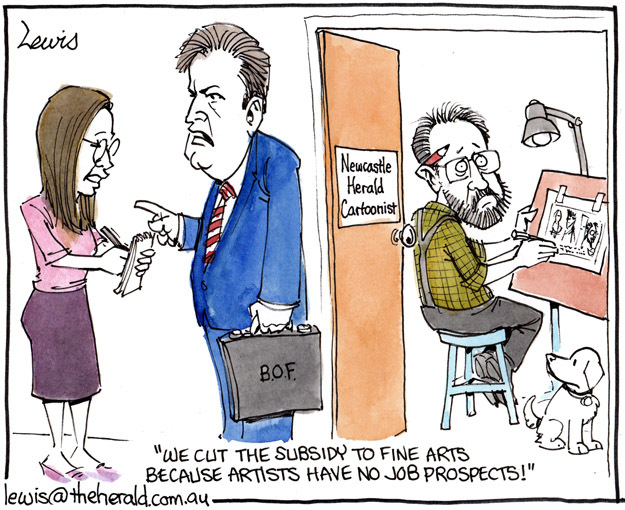 Premier Barry O’Farrell justifies this by claiming artists have no prospects of finding work. I used myself as a case for the defence. Many people however don’t think I’ve got a real job. This entry was posted in Editorial Cartoons and tagged art, art courses, artists, australia, Barry O'Farrell, budget, budget cuts, cuts, NSW, politician, politics, TAFE on November 29, 2012 by Art by Peter Lewis.